Back in December of 2017, I had the honor of interviewing music legend, entrepreneur, and astrologist Jack Gillen. I received quite a few emails of admiration for all the work Mr. Gillen has done following the interview. Jack Gillen is the only person in the U.S. to be awarded a gold record for selling the most Elvis Presley records. Mr. Gillen also played a big part in the development of the Miami Sound during the 1960’s. Mr. Gillen is also a brilliant author, who has written and published over forty books. Truly, Jack Gillen’s contribution to human society has been nothing less than remarkable. During the time of our interview, however, Mr. Gillen had recently become a widower. In some ways this sad event became the fuel for Mr. Gillen to complete and make good on some of the ideas he had put in place earlier in his life. Zodiac International is one seed that Jack Gillen planted that is now beginning to take flight. Zodiac International Music is a multimedia company that governs Jack Gillen’s creative talents of music, writing, astrology, and those of artists fitting the same caliber. His newest single Miami to Las Vegas is a tremendous track that reveals Mr. Gillen’s musical genius. Miami to Las Vegas falls into the genre of electronic dance music (EDM). The song is cleverly put together and advocates a spirit of celebration. The track’s thumping beat and stirring keyboard riffs makes Miami to Las Vegas surpass any expectation we had of the title. 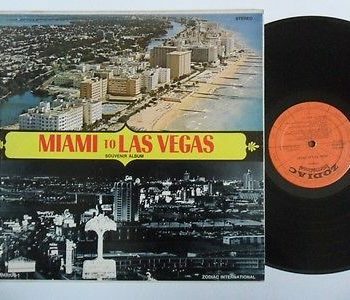 The origin of the title “Miami to Las Vegas” begins when Jack Gillen went National Airlines in 1969 with a promo idea called Miami to Las Vegas where they have songs for each city. Although the airlines loved the song, they couldn’t provide with an advance needed to bring the idea into being. It is good to see Mr. Gillen complete this vision in song. Another Jack Gillen production that is developing nicely is Today, Tomorrow, and Forever. This will be a book and an album. Today, Tomorrow, and Forever is a beautiful and enchanting composition. Jack Gillen’s wife provides an amazing performance. Not only is Today, Tomorrow, and Forever a breathtaking song, but touches upon the realms of sacrilegious art. Jack Gillen has done a tremendous job in reigniting Zodiac International Music. This is a vehicle that will provide future generations with a wonderful template of artistic expression and spirituality while serving needs of present-day spiritualists and music enthusiasts. Bravo! ‘Miami to Las Vegas’ is a great track for exercising. The energy makes you jump all the time. ‘Today, Tomorrow and Forever’ is such a beautiful song!